It feels like we just started this era yesterday. The end of an era, truly. The Sixth Doctor was here for nearly 10 seasons. Wait, you’re telling me that in this universe he only had two seasons? How did you guys cope? So you didn’t get The March of the Valeyard? Devastation of the Daleks? The Damnation? I can’t believe it, this really is the darkest timeline. 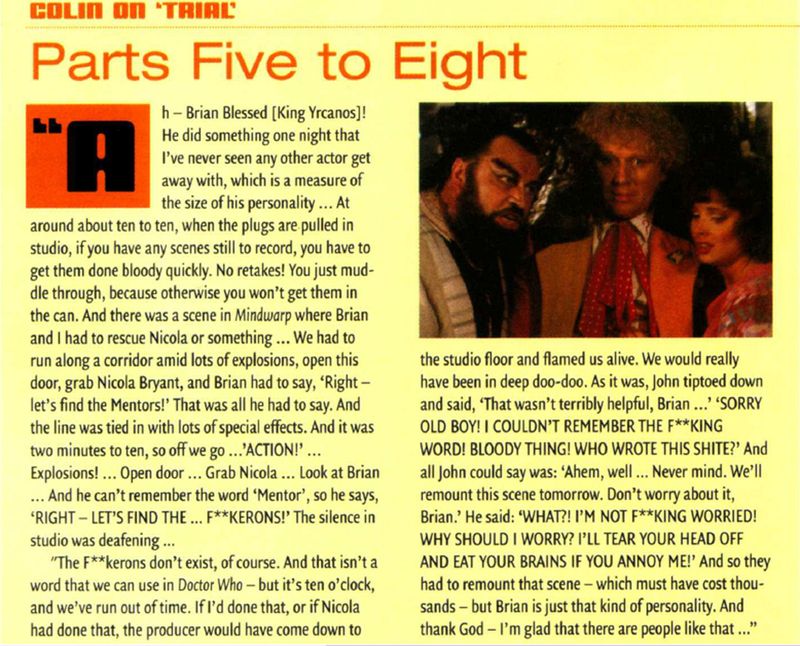 Well, here’s the Sixth Doctor retrospective anyway, featuring an additional discussion of Spiral Scratch. Spiral Scratch was written by Gary Russell and released on the 4th of August, 2005. 21:08 Dirk Gently’s Holistic Detective Agency is a book by Douglas Adams. It’s kind of inspired by the Doctor Who serials he wrote, but I thought it was boring and also terrible. 31:08 It’s The Langoliers, which is from a larger collection by Stephen King. 48:24 Bamboo. Bamboo. Bamboo. Bamboo. Bamboo. Bamboo. Bamboo. Bamboo. Bamboo. Bamboo. Bamboo. Bamboo. Bamboo. Bamboo. Bamboo. Bamboo. Bamboo. Bamboo. Bamboo. Bamboo. Bamboo. Bamboo. Bamboo. Bamboo. You know eventually they’ll make Bible of the Daleks because there’s only so many words you can use for ___ of the Daleks. Here come the Daleks again. Is there some sort of unwritten pact that they have to appear for every doctor? Because they have so far. At least for us, I’m not counting the reboot (yet). It’s Revelation of the Daleks, written by Eric Saward and aired in March of 1985. 7:56 The Star Wars Holiday Special, largely regarded as one of the best 3-course dinners of all time, was aired only once on November 17, 1978 B.C. Written, directed, produced, and baked to a golden brown by the artists formerly known as George Lucas and Jar Jar Binks, it has been made widely available in a number of different formats, such as VHS, Blu Ray, Laserdisc, pdf, and cereal box activity. You can check out the Holiday Special in all its glory here. 19:13 Barrow just changed its name back to Utqiagvik. 20:20 According to this site, countries that list an indigenous American language as an official language are Bolivia, Guatemala, Paraguay, Peru, and Venezuela. It doesn’t list Greenland, but it’s one too, and there are probably more. 24:27 Yeah, looks pretty cool. 31:46 Apparently it took 5 years, but Terry Garrett completed Ocarina of Time completely blind. Here’s the full playlist of all his Zelda videos. *Whomobile does not actually appear. This week, the slog through season 22 continues. Luckily our distress call was heard by The Second Doctor and Jamie, so they’re shown up to spice up the serial a bit. It’s the Two Doctors, written by Robert Holmes and aired in February and March of 1985. 3:44 Looks like it was just retconned. Just like how they retconned the Third Doctor into being a world champion hula hooper. Definitely not making this up. Seriously. Look it up if you don’t believe me. I question whether the choreographers even knew how to read a choreograph. So, the universe is populated by more rogue time lords than we thought. Seriously, every week it feels like they add another one. This time it’s The Mark of the Rani, written by Pip and Jane Baker and aired in February of 1985. 5:49 Another 30 seconds on google only brought up Doctor Who stuff, so I guess it’s a totally original name. This blog gives an explanation of the name (using this as a source) but who knows how true it is? Either way, I really like “Parabola Rainbow Moondancer Galadriel.” That should have been her name. 12:54 The wiki lists a lot more, including Susan and Drax. How could we have forgotten Drax? 16:16 This one. I almost forgot how not good at all Family Guy is. 32:53 Yeah, it’s a gyroscope.